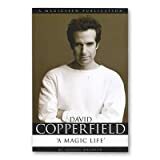 This is work of creative art and satire (17 U.S. Code § 107) David Copperfield, is an American magician, described by Forbes as the most commercially successful magician in history. Copperfield's television specials have won 21 Emmy Awards of a total 38 nominations. Best known for his combination of storytelling and illusion, Copperfield's career of over 40 years has earned him 11 Guinness World Records, a star on the Hollywood Walk of Fame, a knighthood by the French government, and he has been named a Living Legend by the US Library of Congress. Copperfield has so far sold 33 million tickets and grossed over $4 billion, more than any other solo entertainer in history. In 2015, Forbes listed his earnings at $63 million for the previous 12 months and ranked him the 20th highest-earning celebrity in the world.